This site is for the enjoyment of modellers everywhere. 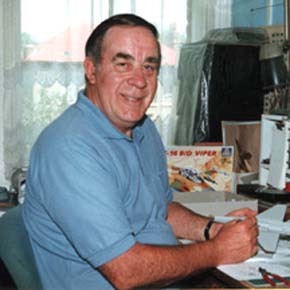 Welcome To "Ted's Modelworks" where you will find photos of my models and reviews, some old some new, plus some real aircraft occasionaly so enjoy your visit. That's me in the "Office" If you like to see other model makers handiwork then this is the place to be, I shall be showing some of my work that may be of interest, in picture and review form if at all possible. There is an aircraft page and a truck page in the gallery and you will find reviews or notes on another. New kit bits will feature any resin bits that come in for review likewise with any new decals that come my way. The readers pages will feature contributors model photos that fit in with the general themes already on view in these pages. a simply ridiculous price and take it away with you when you visit. but most can be seen on this site somewhere. Italeri V22 Osprey Revell BV.222.